God loves to surprise me. Here are some the delightful surprises (events or new insights) that took place during the time the Way of Love 100 Steps was being gradually put up on this web. - “Humor is your best friend,” is a slogan of Recovery, International for anger, fear and depression. Here is a cut incident. I was in the middle of a fierce argument with someone. My daughter, Diana, who is an artist, was listening. She quickly drew a cartoon of the 2 of us disputants. That was the end of the argument. - Did you know that older people get such joy out of seeing younger people make mistakes? Yes. We are so afraid of senility, so every time a younger person messes up we smile! - Want a lot of help with parish bazaars, rummage sales? Enlist the over 70 crowd. 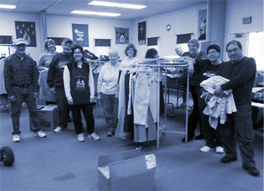 At my parish in California there were ninety year-olds going through bags of donated clothing at a pace that made me dizzy! - Random thought: Are we God’s reality show? - Anxiety about trifles comes from a peculiar type of gluttony: greed for pleasure and fear of displeasure. If I am looking to do penance all day for some special intention, I don’t have anxiety. - A new friend, a grandmother, related how when her kids and grandkids were little she always cuddled them in her bed. She says that now, even at age 30 one granddaughter when she visits insists on this treatment. How’s that for a good form of the ridiculed “touchy feely”?